Sabah Parks officials had great news for audiences at the recent IUCN World Parks Congress: by mid-2015, the country’s largest marine protected area, Tun Mustapha Park, will finally be gazetted after a 12-year campaign. Sabah Parks officials had great news for audiences at the recent International Union for Conservation of Nature (IUCN) World Parks Congress, which took place November 12-19, 2014 in Sydney, Australia. The news is a high point in TMP’s long journey to recognition, which began in 2003, when it was established as a priority marine conservation area by the State Government of Sabah and proposed for gazettement. TMP is set to be the largest marine protected area (MPA) and the first multiple-use marine park in Malaysia, valued for its marine and coastal ecosystems as well the economic value of its abundant resources, and Tengku Adlin emphasized that its management will be a collaborative effort between government and local stakeholders. “TMP represents a major push towards community involvement in protected area management in Sabah,” added Sabah Parks Assistant Director Ludi Apin, citing the “diverse cultures” of the communities who lived off the bounty of the park. The sheer size and expanse of TMP underscores how far Malaysia has come in its efforts to protect its waters. Tengku Adlin recalled the gazettement of the 1,740-hectare Turtle Islands Park in Sandakan, an important nesting ground for hawksbill and green turtles, in 1977. The 4,900-hectare Tunku Abdul Rahman, off the coast of Kota Kinabalu, was gazetted in 1974. Malaysia became a signatory of the Sulu-Sulawesi Marine Ecoregion conservation plan, along with Indonesia and the Philippines, in 2004; experts from the region had already singled out the Kudat-Banggi Priority Conservation Area in northern Sabah some years before. The proposed area is a biodiversity hotbed, home to dolphins, dugong, turtles, crocodiles, and many more charismatic species living in habitats ranging from reefs to mangroves. 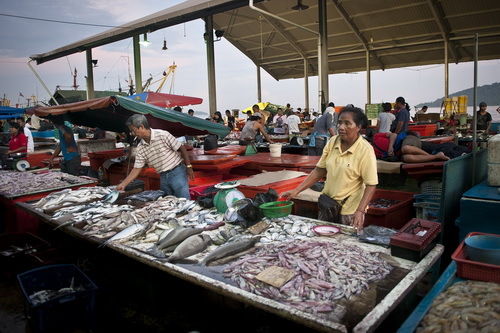 In 2011, the value of fisheries in TMP was estimated at RM561 million (approximately US$167 million, according to a Valuation Report commissioned by WWF-Malaysia), including the yield from the highly lucrative live reef fish trade. Its very richness, however, has also made TMP vulnerable to habitat degradation, overfishing, commercial fishing, and illegal fishing methods using dynamite and cyanide that have caused much destruction. WWF Malaysia has identified several strategies for the management of TMP. For an area this size, community consultation is critical. “This is not business as usual, this is a large marine park, and it requires many consultative activities with many stakeholders from the top management of state government to the bottom—the communities,” said Apin in an interview with Tory Read of USAid, which funded the Coral Triangle Support Partnership (CTSP) with Sabah Parks and WWF-Malaysia in 2010-2013. From 2006 to 2007, WWF Malaysia worked with Sabah Parks to survey over 500 residents from 58 villages in TMP and held several discussions on the proposed area. The benefits of marine protected areas must also be made clear to all stakeholders. 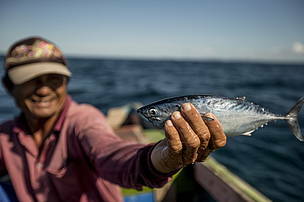 Maliangin Island in southern Banggi was the first demonstration site for a fish sanctuary, established in 2006, through which such rewards as improved biodiversity, spillover and improved fish catch, and a better standard of living for the community were observed. Officials of Malaysia’s Department of Fisheries participated in CTI-CFF-conducted workshops on the Ecosystem Approach to Fisheries Management (EAFM) for a broader perspective. Alternative livelihoods have been encouraged, such as the traditional weaving of products from pandanus leaves by women from Maliangin and Banggi Islands, now enjoying a revival. Most significantly, communication, education, and public awareness development must be continuous, especially on issues such as EAFM, climate change, and the implications of TMP’s gazettement for the people who call the park home. Novel initiatives like the Banggi Youth Club, young residents of Banggi Island looking out for the environment, are helping spread the word to the younger generation through specific activities such as community education, reef monitoring, beach cleanups, and school presentations. “Once gazetted, Tun Mustapha Park will be evidence of Malaysia’s commitment to the Coral Triangle Initiative,” Chairman Tengku Adlin said. As Malaysia has proven, it is a commitment as grand and all-encompassing as the park itself. 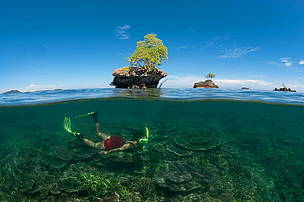 Tun Mustapha Park is almost a million hectares of coral reef, mangrove, seagrass, and valuable fishing grounds. Tun Mustapha Park is home to some 80,000 people, many of them making a living from the sea.